ACR News recently reported that Apple has decided to invest more than 1.7 billion euros into data centers over the course of the next two years. What will the money be used for? Among selecting a location, building the structure, and bringing a data center online, industry professionals must ensure that the center’s temperature-sensitive equipment maintains an ideal operating temperature. In fact, data centers make up two percent of all electrical energy used in the US, so the need to ensure optimum efficiency has never been greater than it is today. 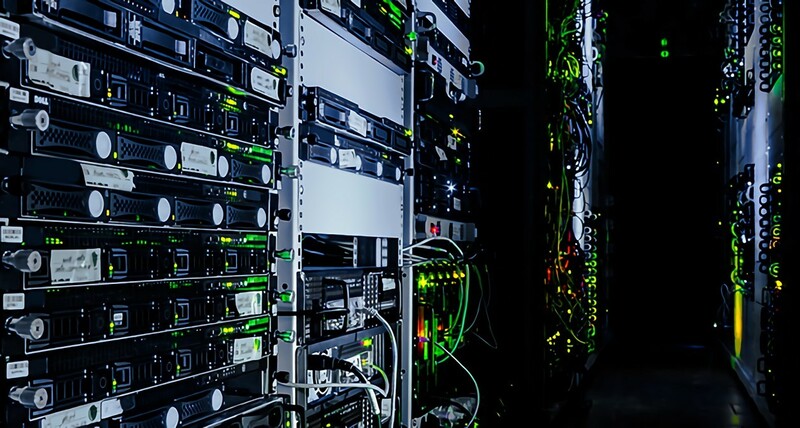 As society continues to produce and store massive amounts of information, computer server and data centers are increasingly relied upon to be up and running with zero-fail backup at all times, with very little allowance for HVAC malfunction or repair. Therefore, proper HVAC maintenance and efficiency in HVAC systems is extremely important in the field of information technology. Server Layout: To address the need for improving energy efficiency while keeping servers cool, Google’s data centers have employed a new tactic for conquering the heat given off by servers, as Slate explains. In order to provide additional air conditioning in data centers, Google has changed the basic layout of the servers to allow for access by staff from the front, accessible portion of the device rather than from the traditionally used back part. “Free Cooling”: Contrary to popular belief, data centers do not actually need to be kept at a constant chilly temperature of 60 degrees; therefore, Google’s data centers maintain a temperature of about 80 degrees. However, as this temperature would be difficult to work in for employees, Google’s data center personnel are allowed to wear shorts and a T-shirt to work instead of a traditional uniform. The higher temperature also allows the company to rely on an evaporative “free cooling” system that uses outside air, instead of turning on enormous chillers that consume tremendous amounts of energy. These, however, are usually still available to use when it’s too hot. The company’s facility in Belgium is the first data center to not use any chillers at all. Location, Location, Location: Facebook is erecting new data centers in cold climates to reduce the energy normally used to cool the servers. Their latest facility is being built in Lulea, Sweden, which is just 25 miles south of the Arctic Circle. However, Data Center Knowledge also stresses that such a low temperature comes with other challenges. For example, the company has to combat the condensation that is created when electronic equipment is moved from outdoors to indoors during transport. Also, humidity levels will need to be watched during the winter. Combination of Cooling Techniques: In hot climates or during the summer, data centers may have to rely on chillers to protect servers from high temperatures. Yet, General & Mechanical Solutionspoints out that an energy efficient data center should take advantage of a combination of supplemental computer room air conditioners and in-row cooling systems. Furthermore, regular commercial HVAC service and maintenance also ought to be part of a data center’s HVAC solution in order to enhance energy efficiency. According to the Employment by Industry Report from the Bureau of Labor Statistics 1, HVACR employment rates in the computer systems design and related services industry, which includes data centers, will see industry-specific growth of 34.7% by 2022. With cloud-based data centers playing an increasingly important role in the computer industry, the need for HVACR technicians in this sector should continue. Those who graduated from an accredited HVACR training program have particularly good chances of entering the field of HVAC repair and maintenance.